Proliferation of GPS-enabled mobile devices has brought a plurality of location-Aware applications leveraging the location characteristics in the shared content, like photos and checkins. While these applications provide contextual and relevant information, they also assume geo-Tagged contents to be representative of the geo-bounded characteristics of location. In this paper, however, we show that the characteristics geo-Tagged contents capture about a location can vary based on the familiarity of user (sharing the content) with the location. 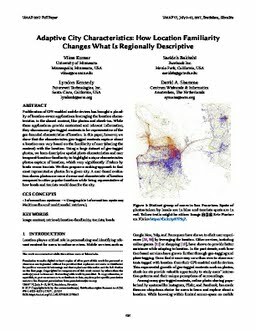 Using a large dataset of geo-Tagged photos, we learn descriptive spatial photo characteristics and user temporal-location-familiarity to highlight unique characteristics photos capture of location, which vary significantly if taken by locals versus tourists. We then propose a ranking-Approach to find most representative photos for a given city. A user-based evaluation shows photos are more diverse and characteristic of location compared to other popular baselines while being representative of how locals and tourists would describe the city.